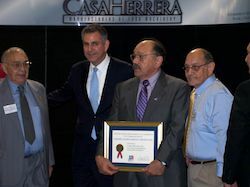 Under Secretary of Commerce for International Trade Francisco Sánchez was on hand to present and visit the facility of Casa Herrera Inc., who was named Exporter of the Year by the U.S. Department of Commerce, International Trade Administration, Inland Empire region. Casa Herrera Inc. was founded by Mr. Frank Herrera in 1951, started with humble beginnings, and would eventually grow into the 130+ employee corporation that it is today. Mr. Herrera was a natural-born salesman and entrepreneur. He attended Northern Arizona University. The story has it: one of Mr. Herrera’s first sales jobs led him through the labor camps in the central valley of California where he mainly encountered Latino laborers. It was there he noticed that although tortillas were a main staple of the laborer’s diet, tortillas were unavailable and scarce. So Mr. Herrera decided he would manufacture small tortilla machines and sell them to labor camps and later to tortilleros in Hispanic areas. Mr. Herrera started by taking a corn tortilla machine, placing it on a trailer behind his car and visiting tortilla factories across the United States until he sold it. Today, Casa Herrera is a third generation family business with Frank’s second oldest son, Alfred Herrera, as its President and employs a total of eleven Herrera family members. Since the company’s inception in the 1950’s, the Hispanic population and demand for Hispanic foods has grown tremendously in the United States and throughout the world. Today, Casa Herrera creates food manufacturing machinery that can produce anywhere from 500 dozen to 7700 dozen tortillas per hour, and chip lines producing up to 5000 lbs of tortilla chips per hour. Casa Herrera Inc. sells equipment all over the world to food manufacturers in the United States, Canada, the United Kingdom, Spain, Greece, Norway, Ireland, Italy, Finland, Egypt, Cyprus, South Africa, Philippines, China, Malaysia, South Korea, Russia, Germany, Brazil, Honduras, Ecuador, Argentina, Japan, Taiwan, and Australia. The company is headquartered in Pomona, California and employs over 130 people throughout Southern California. Casa Herrera has been working with Fred Latuperissa, Director at the United States Department of Commerce, in collaboration with Pellson Lau, SBA Regional Manager, for the past fifteen months in effort to expand its ability to export and to improve the local economic climate in the Inland Empire region.